Last week you learned the phrase “it’s a long story“. Someone asks you a question. You know the answer to that question would be very long or you’d rather not answer. 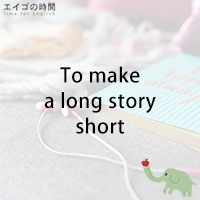 Then you can use this phrase, “it’s a long story“. Now, you may want to tell them what happened but in a small number of words. What would you do? Well, you can simply say, “to make a long story short” at the beginning and then tell the end or the main point of the story without giving all the details. For example, Macmillan gives an example sentence which goes: To make a long story short, we spent the night in jail. If you end up spending a night in jail, there must be a long and complicated story. But when you make a long story short, you just tell them what happened in the end without telling why or how that happened. To make a long story short, we spent the night in the airport. Next Post ちょっといやかも。 – I’d rather not.